The massive cat head on the side of last year’s Sno Pro-edition snowmobiles…that’s the work of Corey Friesen. 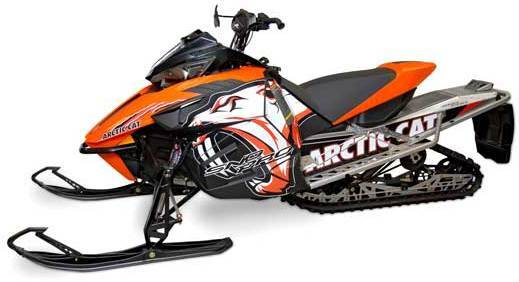 Same with the two-sided color combination of the all new race sled. In fact, pretty much all the graphics and colors that have graced Arctic Cat snowmobiles, ATVs and side-by-sides for the past decade have come from the creative mind of Friesen, whose job title is Senior Graphics Stylist at Arctic Cat. If you think there’s no future to doodling in “playing” with decals, read what Friesen (41) has been able to accomplish. Here's an interview with the man. AI: Okay, as Senior Graphic Stylist, what it is you actually do? 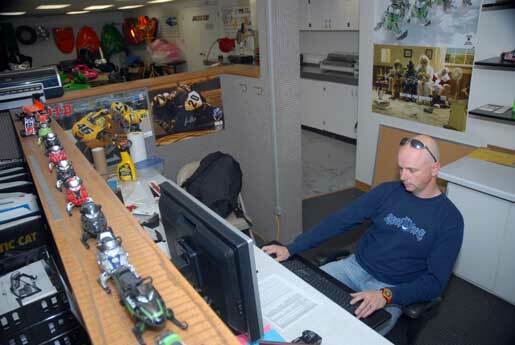 Friesen: I design the graphics and colors for snow and ATV products including the Wildcats and Prowlers. Basically all Arctic Cats that have decals on them are designed by me. AI: Do you perform your creative work on a computer, notepad, rock, etc…? Friesen: Pretty much all of my design work is done on the computer. There is some hands-on work with mocking up of full scale machines with plotters/printers and decal striping with a well-experienced Xacto knife. AI: At the creative stage, are you given free-reign to create whatever concepts come into your head, or do you work within certain parameters? Friesen: The most important thing when designing is to have designs that fit with the current trends. Sometimes I have to predict the future in a way because what I design today will not hit the showroom floor until a year or more from now. 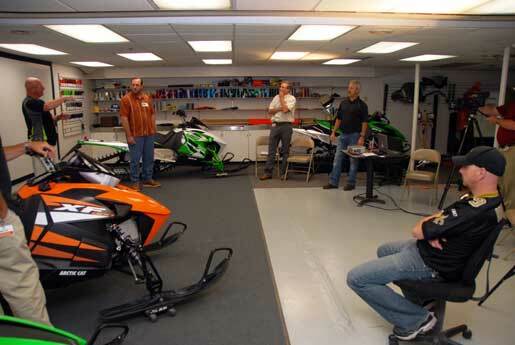 Each sled or ATV has its own demographic and customer base. Obviously I will not put a skull and cross bones on a touring sled that an older person would most likely buy. As much as I would love to go race-crazy on everything, the powersports industry has quite a diverse customer base that has to be taken into account for each machine. Over the years I have slowly been given more free-reign on styling. I try not to waste time putting designs together that I know will never see the showroom, but once and a while I will throw a concept at the styling committee that make them wonder what the heck I have been smoking. AI: Do I need to remind you that Arctic Cat is a smoke-free company? Anyway, how many graphic package options will you come up with for consideration for a particular model year? Friesen: It varies a lot actually. I remember back when I was designing the first Firecats, I must have pitched 10 designs before I got it right. Then there have been other times where I hit it out of the park on the first concept. There is a lot of emotion that goes into snowmobiles especially. 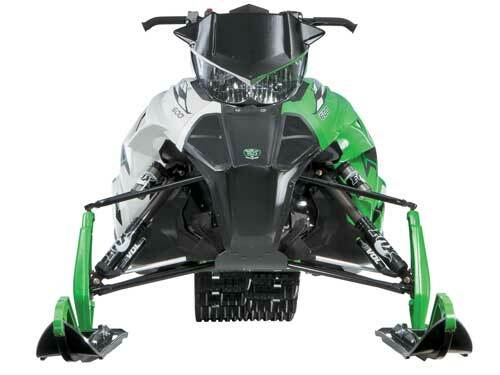 The Arctic Cat snowmobile rider comes with a lot of expectations of what his Arctic Cat should look like. Of course, we can’t please everyone, but it is the die-hard Arctic customer that made this company what it is today, and I have to make sure we take care of that customer for sure. 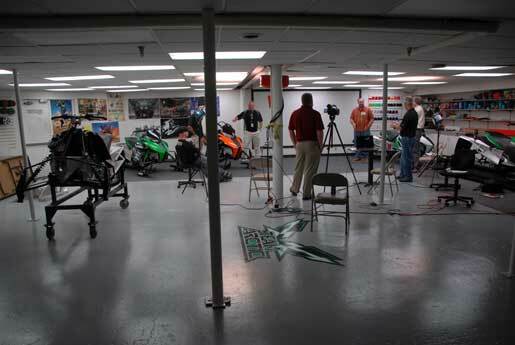 One portion of Corey's "office" inside the Arctic Cat Styling department. AI: What are the greatest challenges of your job and the greatest satisfactions? Friesen: The greatest challenge of being a powersports designer is pleasing a vast group of people with different tastes, attitudes and income, and making a machine that they will be proud to own. Beyond a machine being reliable, powerful and fast, it needs to look good. 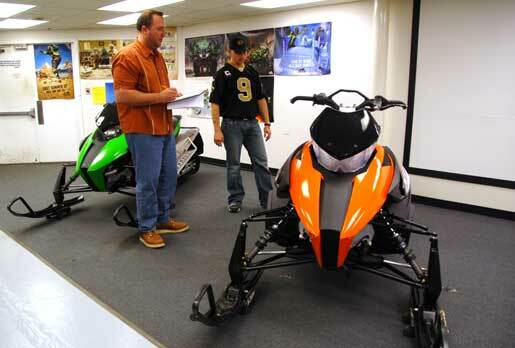 Snowmobile and ATV enthusiasts usually want to have the best looking machine on the snow or trail. I literally have tens of thousands of people that critique what I do every year. Friesen (r) and Nathan Blomker, Senior Industrial Designer at Arctic Cat, are the two people whose creative genius produce the machines we ride. The greatest satisfaction is hearing how happy people are with their new machine and how good it looks. I always look forward to spring when I get the feedback from dealers at the dealer show when we debut the machines for the first time. Knowing I have a big part in the consumer’s choice to purchase a new toy means a lot. AI: Is coming up with graphic designs on the new ProCross and ProClimb machines different than with the Twin Spar or Sno Pro race sleds? Friesen: Very much so! The Twin Spar and Sno Pros had softer, curvier body styles which made it a challenge to design graphics that can be applied quickly on an assembly line. When our workers have to place the same graphic on 300+ times a day it needs to be easy to do. The Twin Spar was a challenge for this especially. The ProCross, with its advanced styling and flat surfaces, made it a graphics dream. The decals are easier to apply for anyone which is a big reason why we came out with accessory graphic kits this year (above). The sled also is much more aggressive looking, which inspires both the consumer riding it as well as myself to make the graphics match the awesome machine they are on. AI: Where do you glean inspiration for your work? Friesen: I attend industry trade shows every year in order to stay on top of what is current in the industry and other industries as well. I get inspiration from many places including the internet, magazines, television, etc. In fact, years ago I got the idea for the firestorm graphics on the Firecats from a comic book of all things. AI: Do you ride yourself, and do you own sleds and/or ATVs? Friesen: Most of my riding background involves racing motocross and riding street motorcycles. I raced motocross in Manitoba most of my adult life. I try to ride sleds as much as I can here at work when the job allows the time to do it. Currently the only ATV I ride is our 90 with my kids. AI: What was your educational background, and how did you get the job? Friesen: I grew up in Steinbach, Manitoba. Out of high school I worked for Lund Boats in Steinbach, Manitoba, doing detailing work, which inspired me to take my artistic talents onward. This led me to the decision to go to Art School at the University of Manitoba. While still in school I started to airbrush my helmets as well as my goalie mask. From there I was painting helmets for buddies and others who heard about me. After I graduated from university with my degree I worked for a small local newspaper, but kept my art business on the side, which then moved on to screen printing graphic kits in my garage for motocross bikes. I then landed a position with a well-known snowmobile garment company in Manitoba for about a year. I had a friend at Arctic who called me one day about a design job that opened up that I should apply for. Dave Thompson was the head of styling back then and five days after a phone call and interview I was in Thief River Falls with the job I have now. Working for Dave was a great experience, allowing me to build on my strengths as a designer and get to the point I am now. I owe my whole career to Dave. Friesen: Good question. I would have to say it is a toss-up between the white limited sleds we did in 2012 and the new split color Sno Pro (above) that will be on the track this year. When I pitched that concept to the styling committee, some of them thought I was nuts. But it quickly grew on them, and now I can say it is a hit before it hits the track. Roger truly cares for the people that work for him. He has these old school comments that make me laugh. Another great interview John. Thanks for your work. Hope to see you at race school. Corey does some fine work! that split color scheme on the new snopro was very creative, great job! such as the jokers, retros and fighter pilots. our family has one of each of those and a 2012 retro is also on the way! will keep on buying them! thanks Corey and John for the great interview! We have a Digi Camo XF SP (mine) and a '12 Retro XF800 Pro (fathers) in the family- delivery of the Retro last weekend. Cats graphics are second to none. The '12 line up had to be the 'knock it out' reference! Love the risk on the 600SP! The split color 600 Sno Pro is a very simple and maverick design. It has this "two-face" style that I find appealing. Look at that sled, Is it white, no look again it's green! The other aspect I like is no matter the how popular the design gets the other 3 would never dare to copy the idea, the design is just to unique to Cat. Everyone can produce a retro sled or a theme based design and skirt the edges of actually copying another manufacturer. With this design Corey has really pushed the envelope of creativity to where the sled seems to have a design within a design. I think in writing this I found the new Cat slogan for 2013. Then do the ad campaign with all of Cat's different "Firsts". Did Corey also do the Nightfire Firecat graphics? One of the coolest ever. Cory! Awesome work, keep it up bud. Need a new paint job on my Bell Moto 7 helmet, can you hook me up? Tema: You are a very gifted wrteir. I cannot tell you how much your mother's story touched my heart and grabbed me. My family's roots come from western Poland. I guess in some remote way, your story connected me to my ancestors three generations past. My heart goes out to all the Jewish people killed and families torn apart. How could all that have possibly happened? Your mother's story is such an inspiration depicting the will to live even against to most impossible obstacles. Man's inhumanity to man is beyond comprehension. I thank you and Dina for doing your part to keep the Never Forget spirit alive. And thanks to all the other Holocaust surviveres who tell their stories too.My father fought the ****'s in WWII. He is now passed on and I am almost 60. Oh how I wish I could have helped in that fight to destroy evil. I can't, but I can do my part to support Holocaust causes.